Looking to pick up a lot of shares of promising businesses? Take a closer look at BioAmber, Codexis, and Keryx Biopharmaceuticals. Why do some companies' shares trade at $100 or more each while others trade at substantially less? There are many factors that contribute to the price of a stock, the most important being the number of shares outstanding. After all, the share price multiplied by the number of shares available determines a company's market cap, which is the true price at which the market values a company. BioAmber is an interesting company for growth-minded investors. The industrial biotech company has genetically engineered yeast to produce bio-succinic acid from low-cost agricultural sugars. The chemical is traditionally sourced from petrochemicals, but the manufacturing process is too expensive -- even at today's market prices for crude oil -- for succinic acid to be used more broadly. In this instance, using a biological production route is actually cheaper than relying on petrochemicals. It's similar to why we make ethanol with yeast and corn sugar instead of petrochemicals, which was the dominant production route not that long ago. 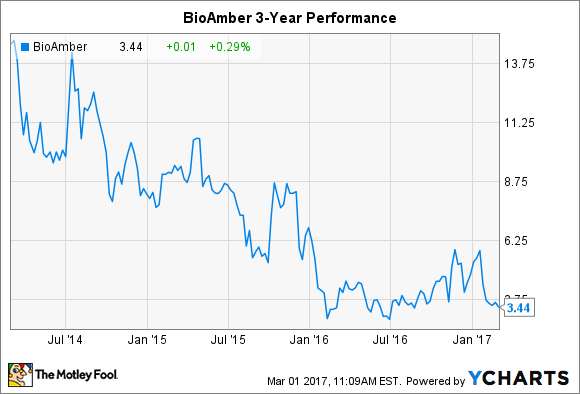 One of the biggest problems for BioAmber has been the dismal track record of industrial biotech companies to date. Analysts have grown weary of the field and have deemed the company guilty by association, but opportunistic investors may want to look more closely. Unlike its peers, BioAmber is focusing on a single biological production route. Since this has already been perfected, the company has ceased research and development activities not related to ramping up its first commercial scale facility in Sarnia, Ontario. That saves a lot of money from running off the ledger, as evidenced by a net loss of just $20 million in the prior 12 months. Amyris and TerraVia have lost $90 million and $136 million, respectively, in the same period. Unlike its peers, BioAmber produces a drop-in chemical that's in high demand in multiple industries. The company had no problem convincing chemical leader Mitsui to take a 40% ownership stake at Sarnia and purchase a significant amount of its production, which will eventually hit 30,000 metric tons per year. In fact, a second facility is being planned that will produce 200,000 metric tons per year of bio-succinic acid -- much of it converted to two other bulk chemicals -- sold entirely to Vinmar. The financial terms should close later this year. The company is still in the early stages of commercial life, having generated just $9 million in revenue in the prior 12 months, although it has steadily improved margins as production volumes increase (something peers have not been able to do). While BioAmber will attempt to strike a balance of government and partner funding for its second facility, the estimated price tag hints that it will need to take on a hefty amount of debt. That's not ideal, but if it can successfully scale operations at Sarnia in the next year, then analysts will be forced to properly account for its growth potential. Codexis pioneered an enzyme engineering platform initially aimed at cellulase enzymes, which break down biomass into sugars that can then be transformed into cheap transportation fuels or a variety of renewable chemicals. That business made sense when oil prices were over $100 per barrel, and Royal Dutch Shell provided an endless stream of funding, but things turned sour shortly after crude oil prices collapsed. Investors sold the uncertainty, and shares have lingered below $5 since. But a reshuffled management team steadied the ship by pivoting the technology platform to focus on improving drug manufacturing. Adding enzymes to pharma production processes can reduce energy consumption, avoid the creation of toxic byproducts, and greatly increase the amount of active pharmaceutical ingredients produced. Indeed, Codexis has won three U.S. Presidential Green Chemistry Awards in a span of seven years for its process improvements, which is more than some of the largest chemical manufacturers in the world. Today, Codexis boasts 15 of the top 20 pharmaceutical companies as customers. That's good news considering biocatalysts for pharmaceutical manufacturing is estimated to be a $1 billion market opportunity. In addition to leading the largely untapped industry, the company has lucrative supply deals in food manufacturing and diagnostics. It's growing revenue at a double-digit clip each year, generates gross margins over 80%, and hasn't needed to raise a penny of capital since its IPO in 2010. 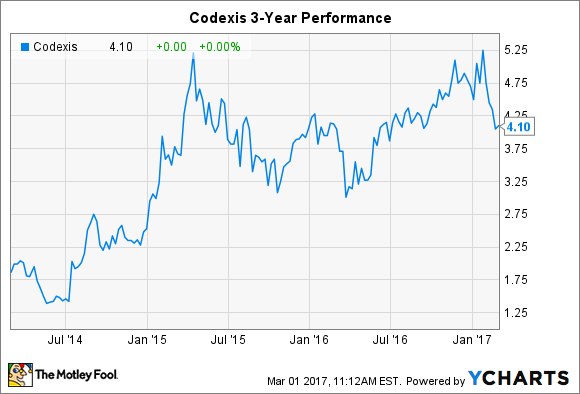 Codexis owns a business model that's just beginning to hit its stride, with the rate of revenue growth actually increasing last year, which makes this sub-$5 stock more than worthy of additional attention. 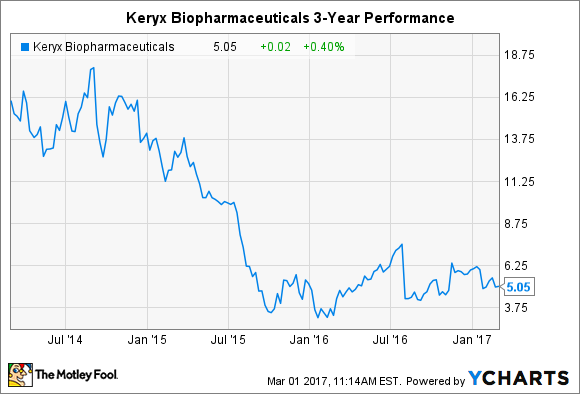 Keryx Biopharmaceuticals encountered a few obstacles in 2016 that crushed the stock. Slower-than-expected prescription growth for its lone drug, Auryxia, left analysts scratching their heads. Auryxia was initially expected to hit peak sales as high as $1 billion, but it generated just $27.2 million in net product sales in 2016. A weak launch was compounded by manufacturing issues that forced the company to find a new production partner in the second half of the year. This creates an interesting dilemma for investors. If Keryx Biopharmaceuticals really does have a blockbuster on its hands, then 2017 will be the year to start proving it. Manufacturing issues are now behind the company, although prescription growth is still in the process of recovering from previous supply problems. Of course, reaching the $1 billion sales mark was always dependent on obtaining additional approvals from regulatory agencies in the United States and Europe. That includes the potential for treating iron deficiency anemia in adults with non-dialysis dependent chronic kidney disease. If approved in the United States this year, Auryxia could be the first oral medicine available for this indication -- and it could launch by the end of 2017. On the other hand, maybe the broader market is treating the stock fairly. Keryx Biopharmaceuticals has no pipeline to develop, which greatly lowers operating expenses, but also increases the pressure on Auryxia. Any missteps in the future not only lower the drug's potential market opportunity but also the company's ceiling on the whole. The stock should perform well in the short term at the very least, as it should be relatively easy to more than double sales in 2017. After that, things may not be so easy.